Alistair McConnachie also publishes Prosperity - Freedom from Debt Slavery which explains how our debt-based money system works and is a Director at A Force For Good which makes a positive case for the United Kingdom. 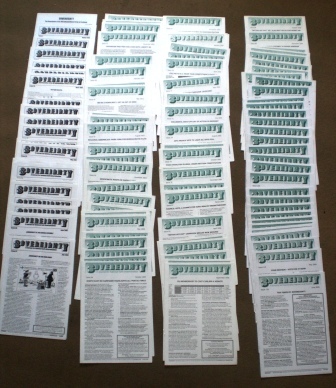 All 120 back issues of Sovereignty are still available and you can purchase them by using the Paypal button below, or by sending a cheque or postal order to the address below. Please note our special offer of the Complete Set at a 45% discount, below. From Issue 42, December 2002, inclusive, Sovereignty became an 8-page publication. Prior to that it had been 4-pages, with occasional "Special Reports" inserted. Sovereignty became - and remains since - the only non-party-affiliated monthly journal in the euro-realist movement in the UK, and the only one, of any kind, based in Scotland. This back catalogue represents a remarkable insight - politically, historically and academically - into this movement during the period July 1999-June 2009. Only a very small proportion of this material is published on this website. But now you can acquire all our 120 issues for a special discounted price. We are pleased to announce that the Complete 10-Year Back Issue Set - worth a total of £162.50 - is available for a limited time, at only £89, including postage. That's a discount of 45% on the normal price. To order today, click this button to make a payment via Paypal. More items available from us in our Bookstore.